Closed elections are being held right now for Hamas’ Shura Council. These elections will shape not only the future composition of the Shura Council, but also the movement’s overall leadership. Senior Hamas official Ismail Haniyeh is expected to be elected head of the movement’s political bureau — and in effect, leader of Hamas. Haniyeh left Gaza Sept. 5 with most of his family members to focus on Hamas’ fateful election campaign. This will be a new era following that of outgoing political bureau chief Khaled Meshaal. In the past, the Shura Council was composed of dozens of religious leaders and imams, but over the years, other forces have entered the council. They include well-educated individuals and professionals from Gaza and the West Bank as well as top Palestinian lecturers from well-known universities around the world. These members keep their Shura Council affiliation a secret. The list of council members is confidential out of concern for the threat of Israeli assassination of Hamas officials. However, over time, their names have been occasionally leaked as the threat has declined. From intelligence gathered over the years (for example, interrogations of Hamas prisoners in Israeli prisons), it is possible to assemble an almost complete profile of the Shura Council. It shows how the movement has changed over time, consistent with processes taking place within it. For example, when Hamas became a political movement, its leadership’s center of gravity shifted. The composition of the Shura Council shifted from religious figures to members of the political wing. In the elections currently underway, the makeup of the Shura Council is expected to radically change once again. A high-level source in the Gaza Strip told Al-Monitor on condition of anonymity that this time, the movement’s military wing, Izz ad-Din al-Qassam Brigades, is more adamant than ever to be part of the council and participate in mapping out its future path. The desire of high-level military members to compete for a foothold in the council was inevitable. Ever since Hamas took control of Gaza and following the subsequent frequent armed conflicts with Israel, power has been concentrated in the military wing, where crucial decisions are made — sometimes over the heads of the political echelon and against resolutions of the Shura Council. One of the most interesting phenomena in these elections is that Gaza’s “youth revolution” seems to have seeped into fundamentalist Hamas. Youths who completed their studies in Gaza’s Islamic University and were active in student associations view themselves as the next generation of Hamas’ leadership. They expect to inject new spirit into a movement that they feel has been stuck in a dead end under the recent years of Meshaal’s leadership. Some members of Hamas’ younger generation belong to the movement’s military wing, while others play important roles in the movement’s welfare organization. Many of them are tired of a stagnant leadership that offers no solutions for the coming years. As far as they are concerned, the election of Haniyeh to lead the movement represents a refreshing change, but it is not enough. They feel the revolution will not be complete until they, the youths, become part of Hamas’ new policy-making elite in the post-Meshaal era. The central question that troubles them is how long Hamas can rule the Gaza Strip under an ongoing closure and without hope for an end. They are also upset that the movement’s old guard is unwilling to grant them entrance to the decision-making hubs of power. According to the same source, Hamas is presently stagnating. There are almost no recent changes in key positions in the movement. This situation created a bottleneck among members of the younger generation, movement activists aged 30-40 who want to advance and exert political influence over the way their movement will look in the coming years. During preparations for the Shura Council elections, certain political deals within Hamas emerged. The deals between various Hamas factions were designed to allow new names to squeeze into Hamas’ closed, fossilized list of Shura Council members. The same source reported that Mushir al-Masri — one of the movement’s “intermediate generation” leaders and member of the Palestinian Legislative Council — has become the address for Hamas’ younger generation, which views him as the key to their success. Over the years, Masri’s outreach activities made him a well-liked man. According to the senior Palestinian source, Masri “encourages youths who studied in the Islamic University to compete for a place on the council, even if their chances of being elected are small in the competition against the military-wing activists.” Masri’s motto is that in order to achieve success, factions in the movement must organize themselves into lobbying groups. At this stage, it’s impossible to know whether these efforts will bear fruit. No one outside the council knows for sure whether the elections are held under democratic, impartial and fair conditions, and no one knows what the members of the military wing are doing to consolidate their power and retain their positions. But one thing is clear: In the Shura Council elections, Hamas is likely to undergo a great shake-up. The election results will be revealed at the end of December. Then we will also know whether Haniyeh prefers to remain in Qatar or return to Gaza and live among his people and the youths who view his election as a harbinger of change. What were Abbas’ priorities at the Fatah congress? Abbas’ Nov. 30 three-hour speech laid out the priorities of Fatah and Palestinians and will no doubt become the guiding principles for the movement, as it tries to accelerate the reconciliation efforts with Hamas, hold a Palestinian National Council meeting, appoint a national unity government, and hold presidential and parliamentary elections. In speaking to some 1,400 delegates, Abbas named all of the past leaders of the movement, including Yasser Arafat (nine mentions throughout the speech). He repeated the name of the movement 21 times as he called on all to respect the movement’s independence. “We hope that all will accept our unique and special situation and respect the national Palestinian independent decision-making process, which we have extracted through huge sacrifices as Fatah has always remained a single unified body committed to its goal and attached to its Arab affiliation and depth,” he said. Al-Quds (Jerusalem) received 15 mentions. “I am full of hope that our next congress will be held in Al-Quds al-Sharif [Jerusalem], the eternal capital of the State of Palestine,” Abbas told the delegates and guests. Palestinian prisoners were featured prominently in Abbas’ speech with nine mentions, especially in reference to veteran Fatah prisoners. “Israel refused to release our prisoners who were jailed before the Oslo Accord as had been agreed.” Abbas mentioned specifically Fatah leader Marwan Barghouti, who would later get the highest votes for Fatah’s Central Committee. He also reminded the congress and all Palestinians of Foad Shobaki, another senior Fatah leader currently in prison. Abbas also mentioned other Palestinian leaders and reminded everyone of Ahmad Saadat, the imprisoned secretary-general of the Popular Front for the Liberation of Palestine, as well as the longest-serving Palestinian prisoner in Israeli jails, Karim Younis. The term “struggle” was mentioned 15 times and “popular resistance” received four mentions. “In every meeting, we repeat calls for peaceful popular struggle. This is our right to practice, and we don’t need one-upmanship on this score. We want popular peaceful resistance, and we extend our hands for peace,” the Palestinian president said. In referring to Israel, Abbas also talked about participating in Shimon Peres’ funeral in September. “We participated in the funeral of Shimon Peres with the goal of sending a message to all that we are seeking peace and that we are willing to go anywhere to the ends of the world to accomplish the goals of our people in freedom and independence,” he said. Unlike at the sixth congress held in Bethlehem in 2009, Hamas was not demonized at the 2016 congress. Hamas was mentioned four times in rather neutral or positive terms. “At this critical junction of our national struggle, I again make a sincere call to the Hamas movement to end the split by means of a national democratic process,” Abbas said. Hamas leader Khaled Meshaal sent a message of congratulations to the congress on its opening day. Hamas, which controls the Gaza Strip, allowed Fatah delegates to attend the congress, unlike in 2009 when the movement refused to allow them to leave Gaza. In the long-awaited speech, Abbas showcased his accomplishments and defended his policies, but made no reference to one of the most important reasons for holding the congress. Mahmoud Dahlan, the renegade Fatah leader supported by a number of Arab countries, was not mentioned once. This reflects Abbas’ success in weathering the internal and external storms, thus ending Dahlan’s place within Fatah. The success of holding the congress and the direction it has taken bodes well for the possibility of the successful implementation of the agreements that were reached with Hamas. Is Iraqi government censoring media’s military coverage? BAGHDAD — The Iraqi government is keeping an eye on local and foreign media outlets that are covering security events in the country, especially the war against the Islamic State (IS), namely in the battle to liberate the city of Mosul. On Oct. 28, the Iraqi security authorities expelled Al-Arabiya al-Hadath TV’s correspondent Ahmad al-Hamdani, who was covering the battle to liberate Mosul. According to the JOC, he was reporting “harmful” information. NABLUS (Ma’an) — Israeli bulldozers leveled private Palestinian lands in the northern occupied West Bank village of Jalud in the Nablus district on Tuesday morning, a day after the Israeli Knesset moved forward with a bill seeking to retroactively legalize illegal settlement outposts in the West Bank, which would see thousands of dunams of Palestinian lands confiscated.A Palestinian official who monitors settlement activity in the northern West Bank, Ghassan Daghlas, told Ma’an that several bulldozers escorted by Israeli settlers and troops started to level lands on the eastern outskirts of Jalud “without prior notice.”More than 40 dunams (9.88 acres) of land belonging to the family of Ahmad Nasser al-Hajj were leveled, Daghlas added.The illegal Israeli settlement outpost Esh Kodesh is located only a few hundred meters away from the area leveled on Tuesday.Daghlas said that the al-Hajj family tried to access the land on Monday to plow it, but that Israeli forces denied them access, confiscating the keys of the tractors they had brought with them.The al-Hajjs emphatically said that they had not received any documents from the Israeli government regarding a decision to confiscate their land. However, residents in Jalud were alerted on April 23 that 5,000 dunams (1,250 acres) of private land were slated for confiscation, in what appeared to be the retroactive legalization of illegal outposts in the area. It was not immediately clear if the land leveled on Tuesday was on the same lands threatened with confiscation in April. 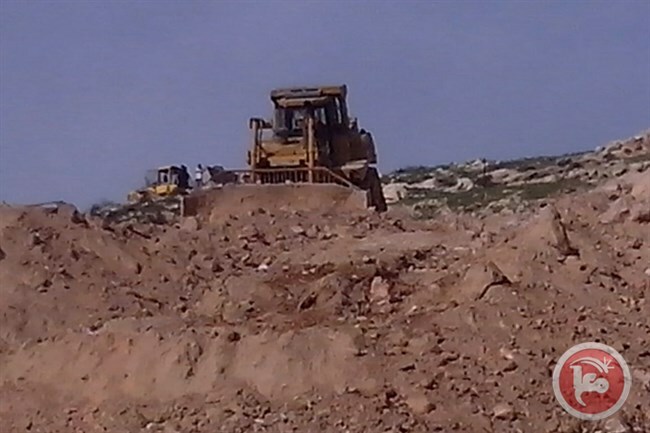 In May Israeli settler bulldozers leveled lands in Jalud as well.A spokesperson for the Coordination of Government Activities in the Territories (COGAT), the Israeli agency responsible for implementing Israeli policies in the occupied Palestinian territory, did not immediately respond to a request for comment on the case.The land leveling came as the Knesset passed a preliminary reading of the “formalization bill” on Monday, which would see thousands of dunams of privately-owned Palestinian land seized and dozens of illegal Israeli outposts in the occupied West Bank retroactively legalized.While the law initially gained traction among Israeli ministers and lawmakers seeking to avoid the imminent evacuation of residents of the Amona outpost, the revised version of the bill that passed Monday does not apply to Amona as it has already been ordered to be demolished by Dec. 25 by the Israeli Supreme Court. In October, Israel’s Higher Planning Committee (HPC) of the Civil Administration pre-approved a plan for 98 settler housing units to be built on Jalud’s lands, which Israeli rights group Peace Now said at the time would likely be used to relocate settlers residing in the Amona outpost. The move was met with widespread international condemnation and came among numerous legally dubious attempts by Israeli authorities to find a solution for Amona. On Tuesday, United Nations Special Coordinator for the Middle East Peace Process Nickolay Mladenov warned the Knesset against passing the bill into law.“If adopted, it will have far reaching legal consequences for Israel, across the occupied West Bank and will greatly diminish the prospect of Arab-Israeli peace,” Mladenov said in a statement.“I reiterate that all settlement activities are illegal under international law and run counter to the Middle East Quartet position that settlements are one of the main obstacles to peace.”The latest report from Israeli human rights group B’Tselem said, referring to the bill, that the “dispossession of Palestinians was never a matter contingent on this legislation, it has been integral to the settlement enterprise from its very inception and is one of the most consistent trends in Israeli policy over the decades.”An estimated 500,000 to 600,000 Israeli settlers reside in 196 illegal Israeli settlements in the occupied West Bank and East Jerusalem in contravention of international law, and a further 232 settler outposts considered illegal both by international law and Israeli domestic law — despite Israeli authorities commonly retroactively legalizing the outposts, according to the Applied Research Institute – Jerusalem (ARIJ).Human rights groups and international leaders have strongly condemned Israel’s settlement construction, claiming it is a strategic maneuver to prevent the establishment of a contiguous, independent Palestinian state as envisioned in the two-state solution by changing the facts on the ground. As 16 Palestinians were seized by Israeli occupation forces throughout the West Bank in a series of pre-dawn raids, Palestinian youth activist Basil al-Araj once again evaded an arrest raid on his home. One of six Palestinian youth who were released from Palestinian Authority prisons after nearly six months of detention when they launched a hunger strike, Al-Araj and other youth were seized in April in what was touted as a victory for security coordination between the PA and Israel. After their hunger strike and widespread attention to their case secured their release, four of the youth – Mohammed al-Salameen, Seif al-Idrissi, Haitham Siyaj, and Mohammed Harb – have been seized by Israeli occupation forces. All four have been ordered to administrative detention, imprisonment without charge or trial. Al-Araj’s family home in the village of Walaja near Bethlehem has been repeatedly stormed by occupation forces, most recently this morning, Wednesday, 7 December, at 1:00 am. His mother stated that they also invaded the homes of his uncles, ransacking their belongings and damaging their property, and ordering Al-Araj’s father and brother to interrogation with the Israeli occupation intelligence. Also early this morning, five Palestinians were seized in Bethlehem, reported the Palestinian Prisoners’ Society, including a child: Mohammed Sabah, 12 years old. The others arrested include Mohammed Ahmed Ali Sheikh, 21, Mohammed Maher Sheikh, 20, Mahmoud Ahmed Sheikh, 22, and Amir Khalil Afaneh, 19. In al-Khalil, occupation forces seized four Palestinians, including Said Sharawi, 43, and his son Ramadan Sharawi, 23; the former prisoner Rajeh Abu Ajamia, 45, and Basil El-Skafi. In Ramallah and El-Bireh, occupation forces seized Nidal al-Hindi and Ahmed Hussein Al-Khasib. In Qalqilya, occupation forces seized Mohammed Ali Radwan, 24, and Asem Omar Sweidan, 21. In Jerusalem, they arrested Odeh Ahmed Khatib, 20, and Amin Hamed, while in Salfit, occupation forces seized Ahmed Mohammed Bouzaya, 26. The Assad regime forces are arresting and forcibly conscripting civilians fleeing eastern Aleppo, the Daily Telegraph reported on Monday. Relatives of detainees said that dozens of military-aged teachers, medics and aid workers have been rounded up and spirited away, as regime troops push further into the city. The brother of one of those detained told how regime forces were detaining men under the age of 40 whom they accused of supporting the armed opposition. “He was not political, he never took part in any anti-government protests,” said Yussef, speaking from the northern Syrian city of Azaz where he and his family are now seeking refuge. Yussef added that his brother Mohammed, 30, a father-of-three, had worked as a nurse at a hospital until a few months ago, when he joined a local medical NGO. Aleppo and its countryside have been subjected to ferocious onslaught by the Assad regime and Russian forces since November 15. Over 900 people, mostly women and children, have so far been killed and thousands more injured in the ongoing bombing campaign on the city and its countryside. The relentless aerial bombardment forced all schools and hospitals in eastern Aleppo to close down and destroyed two civil defense centers. Yussef said he knew of many others who have suffered the same fate and feared there were likely hundreds more than reported. The Telegraph spoke to two other families which confirmed the detentions. One father, whose son was arrested 10 days ago, has heard his son was already fighting with regime forces in the eastern city of Deir Ezzor. The Assad regime has been looking to bolster its dwindling forces, having suffered a huge loss of manpower during the bloody five-year-conflict. Thousands of Syrians in rebel-held areas on Tuesday took to the streets to condemn the war crimes being committed by the Assad regime, Russia and the Iranian-backed militias in Aleppo. The protestors held placards reading “Rage for Aleppo,” denouncing the international silence over these disposable crimes. “Even if it did fall, Aleppo will not change the fundamental underlying complexity of this war. If Assad takes over Aleppo, is the war going to end? No. Will he have solved the political challenge of bringing people together to unite the country? No,” Kerry told a press conference after a meeting of NATO foreign ministers in Brussels. Aleppo and its countryside have been subjected to a ferocious onslaught by the Assad regime and Russian forces since November 15. Over 900 people, mostly women and children, have so far been killed and thousands more injured in the ongoing bombing campaign on the city and its countryside. Indeed, Flynn has previously said that “fear of Muslims is rational” and describes Islam as a “cancer.” But some analyses of Trump’s pick for national security advisor have glossed over Flynn’s sweeping anti-Muslim statements. Bloomberg View columnist Eli Lake, for example, described Flynn as having “spoken and written at length about combating radical Islam, not just the most extreme terrorist groups inspired by this ideology.” And mainstream publications like Politico and The New York Timeshave published articles focusing on Flynn’s fixation on combating “radical Islam,” which Flynn sometimes acknowledges is separate from, although closely related to, the Islamic religion. But a video published by Dinesh D’Souza’s “head researcher,” Kimberly Dvorak, shows Flynn engaging in a lengthy interview one day before his speech at the GOP convention in Cleveland. I always say use the phrase “invest in civility and not in conflict.” If you invest in civility you’re helping a nation, you are challenging a nation. So, like Kuwait or the UAE or the Saudis or Egypt or any one of them. You’re challenging them to take a hard look at their entire system, their entire ecosystem, because if they want to have their religion, their quote-unquote religion, and they want to have their security, and they want to pretend like they have women’s rights, and they pretend like everything’s fine, … I can tell you, it’s not. In 2015, there were more books translated in Spain, that year, in one year, translated into Spanish, than there were books translated in the Arab world for the last thousand years. OK? So a thousand years ago, the Arab world would have had all the Nobel prizes – Science, Art, Peace – they would have them all a thousand years ago, so what changed was this guy Muhammad comes into play and, honestly, we’re dealing with a text that is ancient and not helpful and a society that lives on that text and it can’t come to grips with modernity, with becoming modern. Flynn regularly calls for a “reformation” of Islam, praising Egyptian President Abdel Fattah el-Sisi for cracking down on the Muslim Brotherhood. But his remarks in the video go considerably further, saying that Islam’s central figure and core tenets are the impediment to progress in the Middle East. Back in June, Flynn published “The Field of Fight,” coauthored with neoconservative writer and Foundation for Defense of Democracies “Freedom Scholar” Michael Ledeen. The world badly needs an Islamic reformation, and we should not be surprised if violence is involved. And we’ve got to stop feeling the slightest bit guilty about calling them by name and identifying them as fanatical killers acting on behalf of a failed civilization. Flynn’s remarks are particularly troubling, given that the 1.6 billion Muslims who constitute approximately 23% of the world’s population are members of a religion he holds incompatible with modernity. Flynn and Ledeen wrote a lengthy diatribe against Sharia law, a favorite bogeyman for anti-Muslim conspiracy theorists, suggesting that Islam and Muslims are undertaking a subversive campaign to undermine U.S. laws. Sharia is the basic legal system derived from the religious precepts of Islam, mainly the Koran and the hadiths (supposedly verbatim quotes of what the prophet Muhammad said during his life). In its strictest definition, Sharia, is considered the infallible law of God. They want to impose a worldwide system based on their version of Sharia law that denies freedoms of conscience, choices, and liberties. Basic freedoms! […] I firmly believe that Radical Islam is a tribal cult and must be crushed. Critics get buried in the details of the sunna, hadiths, the umma and the musings of countless Muslim clerics and imams. These so-called Islamic scholars keep their message so complicated so as to create chaos, to confuse in order to control. Now, Pol Pot, Stalin, and Mussolini were transparent. Sharia is a violent law that is buried in barbaric conviction. Perhaps the scariest part about this to a man who grew up in tiny Rhode Island is that the Organization of Islamic Cooperation (OIC) now says if we criticize the Prophet or Islam, we can be charged with blasphemy. That is like saying as a Roman Catholic (and a Saint Mary’s School-educated Catholic at that), I cannot criticize the priest who raped and the cardinals and bishops who cover it up! Muslims want to apply Sharia law by using our own legal system to strengthen what many Americans believe to be a violent religious law that has no place in the United States. Although his previous remarks often conflated Islam and “radical Islam,” allowing journalists to ascribe his inflammatory comments to a rabid hatred of Islamism and Islamic radicals, this interview, alongside the musings in his book, shows the national security adviser-designate explicitly deriding the entire Islamic religion, its central prophet, its holy book, and its followers. Fortunately for Flynn, he won’t face a Senate confirmation hearing for his position. But the Trump transition team—where Flynn’s son, who promoted the “Pizzagate” conspiracy theory, was but is no longer involved—will, no doubt, be under increasing pressure to rescind Flynn’s appointment. RAMALLAH (Ma’an) — Despite international media Wednesday claiming that Palestinian Authority (PA) President Mahmoud Abbas had received an invitation to meet with Israeli Prime Minister Benjamin Netanyahu in France, the spokesperson of the Palestinian presidency denied that any such invitation was sent to Palestinian leaders. 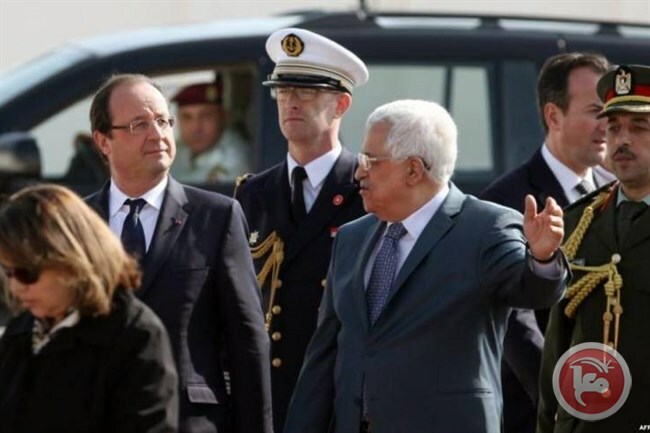 International media reported that French President Francois Hollande had extended the invitation to both Netanyahu and Abbas to meet during the multilateral French peace conference expected to be held in Paris on Dec. 21. However, the spokesperson of the Palestinian presidency, Nabul Abu Rdeineh said in a statement that Palestine had not received the invitation, but confirmed the PA’s support of any French efforts that could positively affect the political situation in Israel-Palestine. The spokesperson also highlighted the fact that Abbas had accepted a previous invitation by Russian President Vladimir Putin in September to meet with Netanyahu. However, Netanyahu rejected the offer at the time. However, The Israeli prime minister staunchly rejected the multilateral French initiative in April, saying the “best way to resolve the conflict between Israel and Palestinians is through direct, bilateral negotiations.” Netanyahu has instead welcomed Egypt’s efforts to restart the 2002 Arab Peace Initiative. The PA has repeatedly expressed support for the French initiative, and in April shelved the submission of a new anti-settlement resolution to the UN out of fear that doing so could thwart progress of new French proposals, causing outrage among various Palestinian political factions.